*This post follows on from my recent article, “Labor: Hide The Increase”. There, I showed that the Rudd Government has fiddled the books to hide their massive increase in borrowing and spending. Please read the article for background to this new article. Here’s a chart I’ve put together from the official Australian Government Budget data. 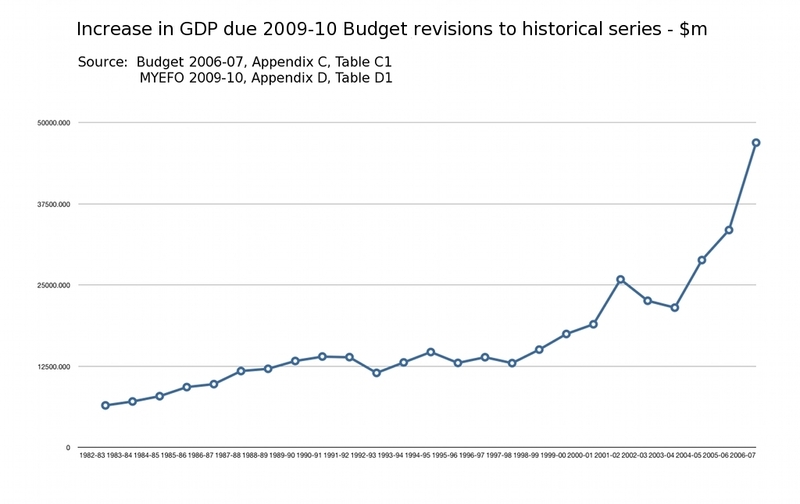 It shows my reverse calculation* of the value (in $millions) of Rudd Labor’s “revisions” to historic GDP. This chart only goes up to 2006-07. The last year of a Coalition government Budget report. That is because the Rudd government has gone back and “revised” the figures in the Rudd Labor 2007-08 and 2008-09 Final Budget Outcome documents too. So I could not find the original reported figures for those years in order to calculate the GDP, and compare to their newly “revised” figures. Even so, you can easily see that Rudd Labor’s “revisions” to past GDP are indeed, a “substantial increase”. For the 2006-07 year – the last year that I am able to compare original vs “revised” figures – it appears that they have adjusted GDP upwards by $47 billion (4.49%) over the original figures reported by the Howard Government. Of course, we can easily perceive just why Rudd Labor would wish to do this….